The Tigers pitching staff this year is made up of Juniors and Sophomores. Head Coach Gage Davis and Asst. 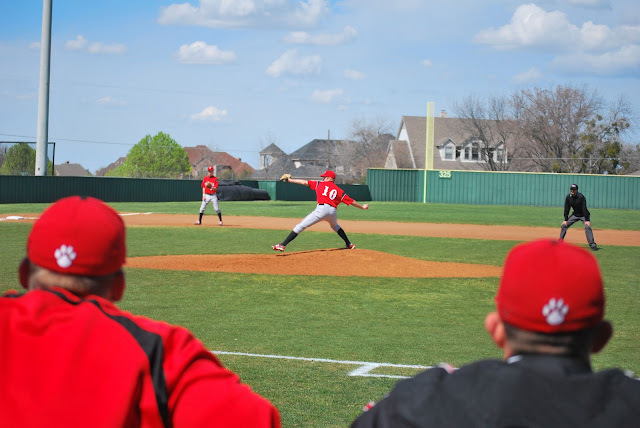 Coach John Chilcoat keep an eye on JR Cody Patton in last Saturdays game against Argyle. Last night I pllayed around video. This is Brian Wickersham hitting a single to center field last night against Waxahachie scoring a run. The Tigers lost the game 10-3. Weather permitting, Thursday the Terrell baseball classic tournament starts at 9AM. Teams coming to Terrell for the tournament are, Wills Point, North Forney, Dallas Sunset, Whitehouse, Tyler John Tyler. Game are scheduled for all day Thursday, Friday and Saturday at the ball field in Ben Gill park.